Thalapathy 61 Leaked Titled as “MERSAL “ an action thriller film directed by Atlee and written by K. V. Vijayendra Prasad. 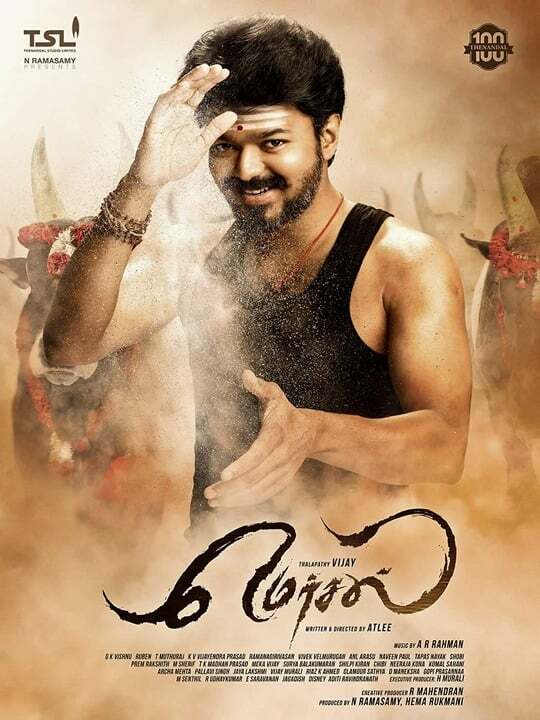 Produced by Sri Thenandal Films, the film stars Vijay, Kajal Aggarwal, Nithya Menen and Samantha Ruth Prabhu in the lead roles, with S. J. Surya, Sathyaraj and Vadivelu amongst others in supporting roles. The producers announced in January 2017 that three lead actresses — Kajal Aggarwal, Nithya Menon and Samantha , would portray roles in the film. Actors S. J. Surya and Sathyaraj also joined the cast, with comedians Vadivelu, Kovai Sarala, Sathyan and Rajendran also working on the film. S. J. Surya is playing as baddie in this movie.Composer A. R. Rahman was also added to the technical team, as were editor Ruben, debutant cinematographer G. K. Vishnu and costume designer Neeraja Kona.